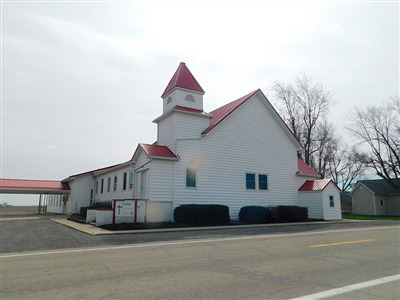 “In 1887 it became necessary to build a new church at its present location during the pastorate of C. Bodey,” states the Van Wert County History published by the County Historical Society. The first Sunday School in the community was held in a log schoolhouse called the Patrick School. It was originally called the Pleasant Union Sunday School so that any or all denominations might pleasantly worship and study the Bible together. The little village of Monticello and its remnant population is located in the very southern part of Van Wert County in Jennings Township, approximately four miles west of Spencerville. The railroad, most originally known as the “Nickel Plate Railroad,” passed through the town. A county history published by Floyd O’Daffer states that Cecil Martins Slenz, one of the oldest settlers in the township, owned a large farm where the village was to settle. By 1910, Monticello had a large general store, a grocery store, a sawmill, two elevators, a blacksmith shop, a tanning mill, a lumberyard, a train depot, repair shop, huckster wagon, an elevator, and brick country school. The history states that the average wage per month for teachers at the time was $34 for males and $17 a month for females. The average value of real estate was $19.39 per acre and $20.74 for buildings. At one time, Monticello was referred to as “The Station.” A small population still inhabits some of the remaining homes anchored these days by the presence of the original Monticello Church. Like most other small hamlets, Monticello suffered its share of tragic deaths and fires destroyed businesses and residences over the years. “Most every home have their own gardens and truck patches,” states the history. I find it interesting that your editor labels this church as "Radical". I'm not sure just what beliefs and practices you consider radical. Yes, they most likely believe that the bible is truth, and that there will be a second coming of Christ. Also, I doubt they condone the killing of babies. This comment has been hidden due to low approval.